Lincoln School of Computer Science, University of Lincoln, UK. Congratulations to Saddam who successfully passed his PhD VIVA on 23rd May 2016. Examiners have commended Saddam’s work and contributions. They also emphasized how well written the thesis is. A well-deserved achievement Saddam, well done. And all the best for your future career. Congratulations to Dr Amjad Altadmri for completeing his PhD degree. 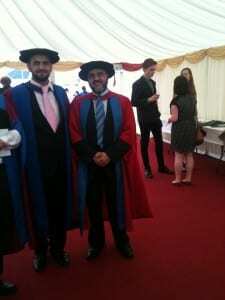 Amjad received his PhD degree in the formal September Graduation Ceremony at the Lincoln Cathedral. His PhD titled “Semantic Annotation of Domain-Independent Uncontrolled Videos, Incorporating Visual Similarity and Commonsesne Knowledge Bases”. The work produced a Framework for semantic video annotation. In addition, VisualNet was also produced, which is a semantic Network for Visual-related applications. The photo shows Dr Amjad Altadmri (Left) with his Director of Studies/Supervisor Dr Amr Ahmed ( right). Altadmri, Amjad and Ahmed, Amr (2013) A framework for automatic semantic video annotation. Multimedia Tools and Applications, 64 (2). ISSN 1380-7501. Alabdullah Altadmri, Amjad and Ahmed, Amr (2009) VisualNet: commonsense knowledgebase for video and image indexing and retrieval application. In: IEEE International Conference on Intelligent Computing and Intelligent Systems, 21-22 November 2009, Shanghai, China..
Altadmri, Amjad and Ahmed, Amr (2009) Automatic semantic video annotation in wide domain videos based on similarity and commonsense knowledgebases. In: The IEEE International Conference on Signal and Image Processing Applications (ICSIPA 2009), 18-19th November 2009, Malaysia. Altadmri, Amjad and Ahmed, Amr (2009) Video databases annotation enhancing using commonsense knowledgebases for indexing and retrieval. In: The 13th IASTED International Conference on Artificial Intelligence and Soft Computing., September 7 ï¿½ 9, 2009, Palma de Mallorca, Spain..
Amjad Altadmri has passed his PhD viva, subject to minor amendments, earlier today. Thanks to the external, Dr John Wood from the University of Essex, the internal Dr Bashir Al-Diri and the viva chair, Dr Kun Guo. All colleagues are invited to join Amjad on celebrating his achievement, tomorrow (Thursday 28th Feb) at 12:00noon, in our meeting room MC3108, with some drinks and light refreshments available. We always welcome contacts and enquiries from Researchers and potential Postgraduates who are interested in collaboration and/or pursuing PG research with us. Keep an eye for new vacancies, projects,...etc.